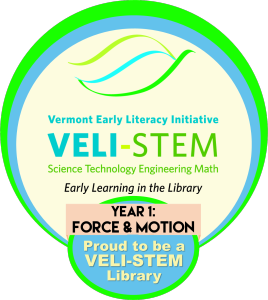 Proud to be a VELI-STEM Library! In August 2015, the Department of Libraries received a National Leadership Grant for Libraries award of $339,861 from the Institute of Museum and Library Services (IMLS) to expand the Vermont Early Literacy Initiative (VELI).The Bradford Public Library is one of 25 Vermont Libraries chosen to participate in the three-year grant project, VELI-STEM, a partnership of the Department of Libraries and the Vermont Center for the Book. The grant includes books and other hands-on STEM materials for the 25 libraries, travel to state and national conferences for networking, project assessment and consultation with The Montshire Museum of Science and the Elementary Education Department at Wheelock College. Bradford Public Library’s youth librarian will receive training and programming for young children, parents, and childcare providers in science inquiry and physical science. This grant program officially began in November 2015.